If your swimming style is about as graceful as a hippo in a tutu, this could be the gadget to revolutionise your holiday poolside antics. 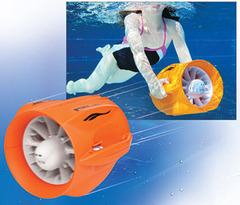 The Pool Jet from IWantOneOfThose is a hand-held underwater device that will pull you gently through the water (saves you embarrassing yourself in front of all the stylish senoritas with your flailing doggy paddle). It’s a good way for kids to learn to swim, and it’s safe too – if they let go of one of the handles the power will automatically cut out, meaning it’ll only work when the user is properly in control. The Pool Jet costs £85, and will keep you going for a good twenty minutes. After that time, you’ll be ready for another cocktail, anyway.